Print using 20% less toner! Just download and use this Ecofont Vera Sans. 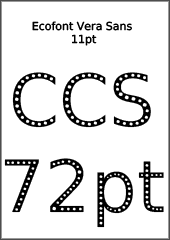 The font has tiny "holes" in it (see image at right) which are virtually invisible when printed at typical font size of 11 pt. 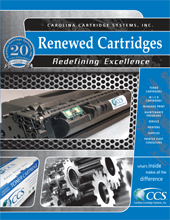 A brief overview of Carolina Cartridge Systems, Inc. including what makes us different than common cartridge remanufacturers, what we do, and why Cost Per Page should be important to you. Because this site is still under construction, you may need a cartridge that is not listed on the product pages. 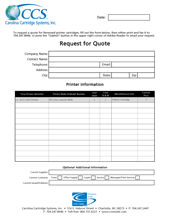 If so, or if you don't know what cartridge fits your printer, just fill out this PDF form and we will get back to you with a price, usually the same day! 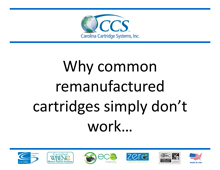 An in-depth look at the dirty little secrets of the cartridge remanufacturing industry, and how Carolina Cartridge has addressed these issues. 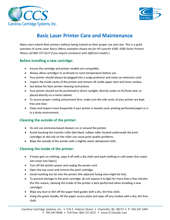 Just like your car, your laser printer needs regular maintenance to ensure its best performance. This PDF covers what you need to do, or you can just request a service call and let CCS take care of it for you! 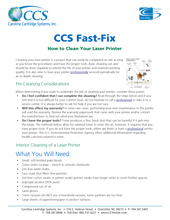 Just like your car, your laser printer needs regular cleaning to ensure its best performance. This PDF covers what you need to do, or you can just request a service call and let CCS take care of it for you!